First, remove the 'entry links' on your splash page via your sitezadmin > Edit Site menu and Section Content tab > Edit Splash page. 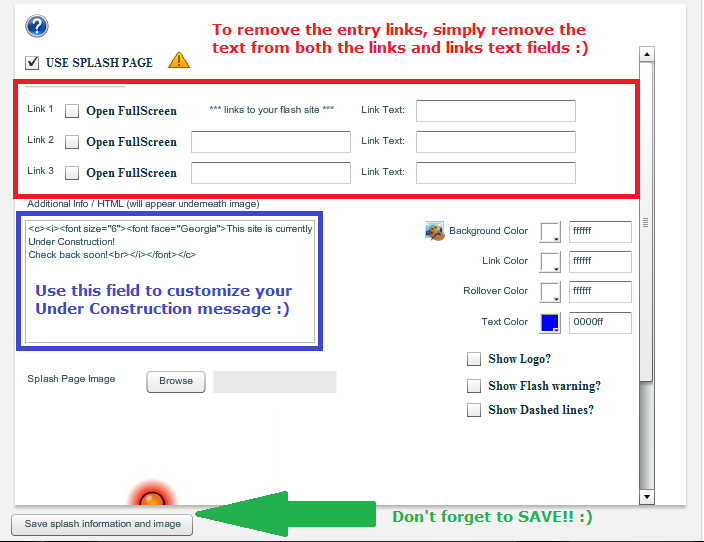 To remove them, simply remove the content from both the link and link text fields. PLEASE NOTE: While this will stop MOST visitors, it is still possible to access your site using direct links, such as www.yourdomain.com/site, etc. If you would prefer to upload a file, you can do so via FTP. Once you have downloaded the file, you will want to access your template files via FTP. This will stop visitors, and will still allow you to access your sitezadmin! When you are ready for your site to be available online again, you will need only delete the index.html file, and rename the original index file back to index.pho! If you have additional questions about this, please contact support@portfoliositez.com!